James Monroe Museum Political Cartoons | You President Baiting, Whiskey Drinking, Poker Playing, Evil Old Men! Here we see President Franklin D. Roosevelt wagging his finger at the House and Senate as they play poker. FDR is chastising the two poker players over the the subject of neutrality. in August, when this cartoon was published, the 76th Congress was considering repealing the Neutrality Act of 1937, which would allow belligerent nations to purchase arms in the U.S. provided they paid cash and used their own ships for transportation. This would have been an unpopular act while the U.S. was on the cusp of entering World War II on the side of the Allies. 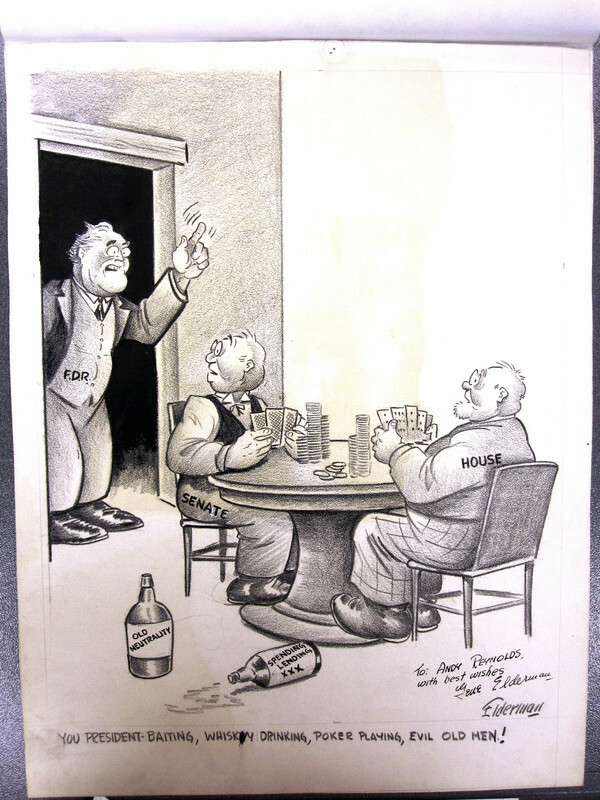 Gene Elderman, “You President Baiting, Whiskey Drinking, Poker Playing, Evil Old Men!,” James Monroe Museum Political Cartoons, accessed April 19, 2019, http://jmpolitoons.umwhistory.org/items/show/99.